With a focus on long term relationships, and no long term agreements, we know how important it is to provide security service that will win your business each and every day. Unhappy With Your Current Service Provider? Serving Edmonton since 1970, TELSCO is Edmonton’s largest full-service security company. We are proud to provide local service and support for brand new security systems installed by us, or for customers looking to make a change from another provider. Unlike many security providers, TELSCO is 100% local and supports all aspects of your security experience from Edmonton. Our local presence allows us to provide you with a personalized level of service that is unparalleled in the security industry. Contact us today to discuss switching your monitoring service to TELSCO. All Operations, including our Monitoring Centre are located at 12750-127 Street in Edmonton. With 5 Diamond Certification, ULC Listing and Award Winning Customer Service, we offer responsive and personalized monitoring that you can count on. You can be sure that when you speak with a TELSCO representative, you are speaking with someone right here in Edmonton. In many cases, we can utilize existing hardware, with the option to upgrade or expand your solution to best suit your needs. A security consultant will discuss how your existing security system can be incorporated into your new solution to ensure you realize the maximum value of your investment. Our experienced technicians are familiar with a wide range of security system types, so you can count on a professional transition of service when you work with TELSCO. We offer competitive monitoring rates and several service options to best suit your needs. 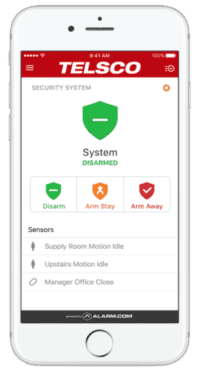 With exciting services, such as TELSCO Connect mobile app, your existing Security System can be updated to provide enhanced Security, Comfort and Convenience. Incorporate Lighting, Locks, Thermostats, Garage Door Control and a Video Doorbell for a totally Interactive Experience. Contact us today to discuss switching your monitoring service to TELSCO.